Avatar’s motion capture techniques showed what was technically possible with the new computer toybox at film directors disposal. Spielberg and Peter Jackson clearly wanted to play in the digital sandbox but needed a film to demonstrate what they could do. Tintin is perhaps a suitable choice, realistically he would not work with real actors and creating the action inside the computer, allows literally anything to be shown on the big screen. Crash landing airplanes in the desert, intricate chases set in a bazaar with impossible stunts, fifty gun galleon’s firing broadsides in monstrous seas, Spielberg directs like a kid let loose in a chocolate factory. Jamie Bell fleshes out the eponymous Tintin with bad guy duties falling to Daniel Craig as Sakharine. Captain Haddock, who spends the entire film in pursuit of his next whisky bottle is provided via Andy Serkis, no stranger to these new acting techniques. It is interesting to see echos of the actors through their motion capture work, not just in their voices but in their facial actions, the way they move, walk and act. For the uninitiated, Tintin is a “cub” reporter providing newspaper articles on fantastic adventures and scrapes that he often finds himself embroiled in, all set within a largely recognisable 20th century backdrop. The film is based on three of the many books written by Herge`, this is classic boys own adventure stuff, lots of derring do in a wholesome family kind of way. The plot revolves around sunken hidden treasure and a model ship, “The Unicorn”, which is a good excuse to bring pirates, generational revenge and other dastardly plans into the mix. The story wends it’s way through a Junior “Indiana Jones” sequence of events and is accompanied by a rousing John Williams score to suit the action on screen. Tintin is aided by the “Thompson Twins” (Frost and Pegg) who are part of Interpol but are inherently inept and stereotypically British, including obligatory bowler hats and umbrellas. Whilst they are designed as the comic relief, here they do not add to the story and tend to drag the action down whenever they are on the screen, notably the wallet scene which appears childish and out of place. The “animation” is beautifully done, clearly pushing the envelope of just what is possible even further ahead. With almost infinite camera angles at his disposal with the new technique, Spielberg has fun mixing up how the audience views the action. Tintin appears real, the audience complaint of “dead eyes” and the simulation of realistic sea and water issues, obviously now fixed. The technique pioneer, “The Polar Express” is already beginning to look quaintly old fashioned and creaky in comparison. Star of the show must be “Snowy”, Tintin’s ever present canine friend. Animated to perfection, with all the best action, looks and comic touches. Pet shops will need to stock up on Wire Fox Terriers, to keep up with demand. The film is fun and obviously orientated towards a family audience, the Thompson twins do mar the action but the film recovers with some excellent sequences, notably a post plane crash propeller incident, dueling port cranes and an exciting motor-cycle sidecar chase. Interestingly released in the UK and Europe before the US, as the character is perhaps better known on the European side of the Atlantic. Looks good in 3D with some decent depth gags but probably not compulsory to enjoy the film. Provided the film is not taken to seriously, there is much to enjoy. Superb action with fantastic state of the art motion capture and CGI animation techniques. 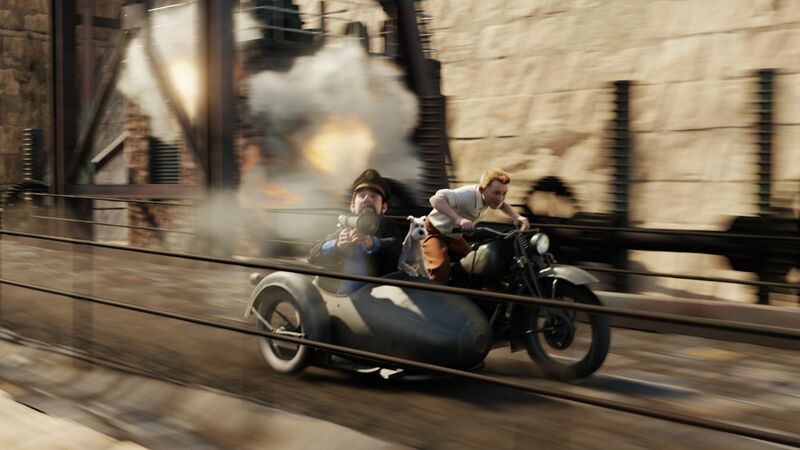 Kids will love the film and there is sufficient depth to keep most parents interested and the send off certainly indicates there is more of Tintin to come.